Hand Painting Tree mural VBS craft – this kids craft idea would be great for many Vacation Bible School themes, just change the tree to match your Western or Jungle decorations. 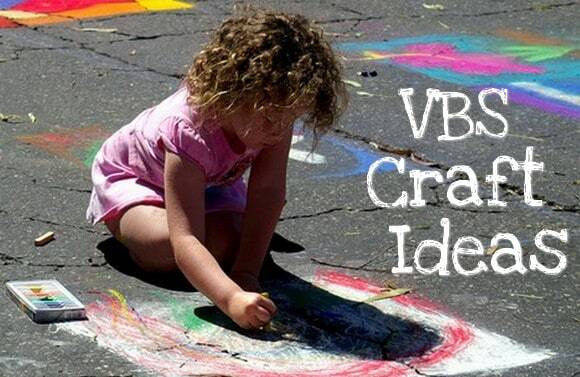 Are Vacation Bible School Crafts Are Important? [ad#ad-1]I’ve heard some children’s ministers question the value of Vacation Bible School crafts. At times I’ve been tempted to do the same. Ultimately, crafts can add a lot to your teaching. If you select the right crafts, they can reinforce the teaching and provide a great way for kids to remember the bible school lessons. Not to mention, most kids love to make them. The primary concern in choosing a Vacation Bible School craft is teaching value. The project doesn’t have to be elaborate or expensive if it makes a real connection to the life truth you are teaching. This can be as simple as writing a key Bible verse on the craft or the whole craft can become a permanent object lesson. The point is using Vacation Bible School crafts as a teaching tool. Most Vacation Bible School curricula publishers do a great job at this. This is one area that can easily break your Bible school budget. This can be avoided with careful planning. Many publishers now offer packaged craft kits that go with their VBS themes. Be careful, these typically cost more than finding the materials yourself. At the same time, it can be worth the expense to save time and simplify the planning process. I’ve heard different figures for Vacation Bible School craft budgeting. Our volunteer craft leaders are very frugal and can put together world class craft projects for the whole week for about $3 per child. This includes making a T-shirt and a woodworking project. Our situation is special, but I would recommend keeping the weekly craft cost under $5 per child or $1 per child each day. If your are looking for free Vacation Bible School crafts, the internet has much to offer. Most Sunday school crafts can be easily used in a bible school setting. Even if you have a great curriculum, you may want to look for other activities that would add variety to your program. Many churches have found our coloring sheets an easy option for at least one day of their VBS program. The right volunteers can make all the difference in how children experience your Vacation Bible School crafts. Look for people who are patient, organized and flexible. Our church is blessed with a retired couple who have served as the craft organizers for several years. They plan each days craft, gather all the materials, and even recruit their craft crew. This takes a lot of stress off me as Vacation Bible School director. It also makes our crafts much better than if I was in charge. If I didn’t have this position filled, I would make it a priority. As with any children’s ministry program, safety should be a concern for Vacation Bible School crafts. This may mean avoiding some really cool projects, but it is better to be safe than sorry. Some safety concern would be toxic glues, glass bottles, or hammers. Almost any situation can become dangerous without enough adult supervision. We have been accident free for several years thanks to our excellent volunteers – that includes all the woodworking projects! Don’t take safety for granted. Tony Kummer (Editor) reviewed & updated this page on : August 31, 2017 at 12:45 pm. All our content is peer reviewed by our readers, simply leave a comment on any post suggest an update.